Sometimes guests need to move rooms during their stay at a retreat center. It might be out of necessity (there's suddenly a problem in their room) or by choice (they want to spend part of their stay in a different room). We wanted to be able to accommodate this process to make life a bit easier for registrars and front desk staff. 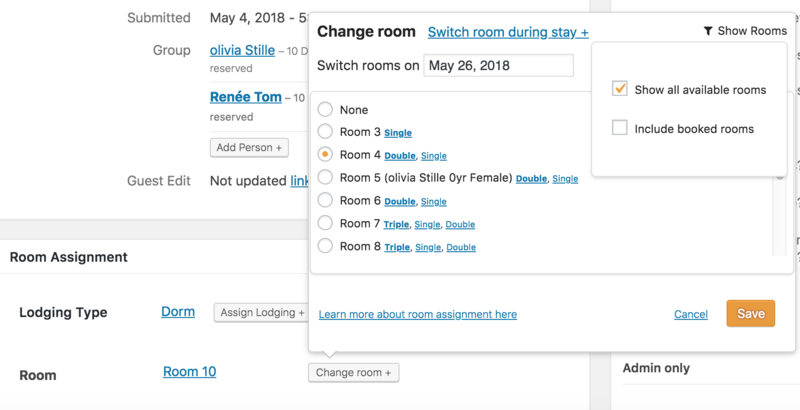 From the Room Bookings Chart or from the guest's participant dashboard, you can move the guest to a new room for part of their stay. Find the guest you're looking for in Registrations, click through to their participant dashboard. Under Room Assignment, select 'change room'. When you 'switch room during stay' you'll be able to pick the date for the switch and then pick their new room. By default you'll see only rooms that are available and the same lodging type (same rate) as the guest's existing room. If you hover over 'show rooms' then you'll have the option to see booked rooms and rooms of different rates too. If you select a room with a different rate, the charges will not be automatically adjusted on the customer's bill. Go to their participant dashboard and edit or add a transaction or a discount to make their bill accurate. Once you save the change, you'll see both rooms appear under the Room Assignment section. Removing the second room will put that guest back into the first room (room 10) for their whole stay. You'll also see the guest's registration split into 2 places on the Room Bookings Chart. There will be arrows to indicate this.